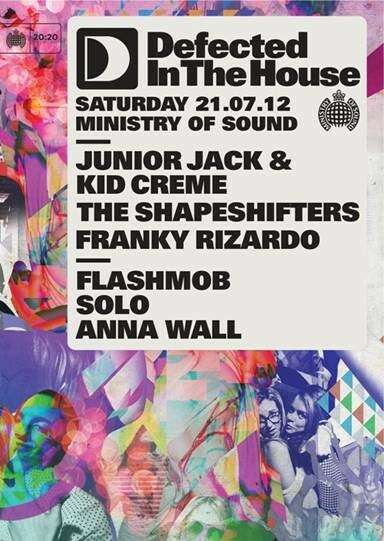 Next month Defected brings two DJ duos in Junior Jack & Kid Crème and The Shapeshifters, supported by some of the best of Europe’s rising talent, to London’s Ministry of Sound. With regular sets at some of the world’s best clubs, Junior Jack & Kid Crème’s energetic, driving take on house music makes them perfectly suited to big occasions and are once again exclusive residents for Defected In The House in Ibiza this year, playing five dates throughout the summer and also recently headlining the first ever Pacha Festival in Amsterdam. From chart-topping singles and underground club bangers to world tours and sell-out festivals, The Shapeshifters play to some of the biggest crowds in house music with their uplifting, main-room sound. Their last record ‘Only You’ took their production in a deeper, more soulful direction than has been their style of late and shows their versatility. The guys are supported by Franky Rizardo, one of the most exciting young newcomers to come out of Holland in the last few years. The 103 is headlined by Flashmob, who burst onto the scene last year with the explosive ‘Brick House’, the debut single for a duo who have – in one way or another – been involved in the music industry for most of their lives. Their third single ‘Need In Me’ was snapped up by Defected and was promptly made Essential New Tune by Pete Tong, and looks set to be one of the biggest records of Ibiza in 2012. Solo is another Defected Records debutant, whose latest record ‘Home Is Where the Hurt Is’ is currently doing damage all over clubland. Anna Wall meanwhile is one of London’s busiest DJs, and a new addition to the Defected roster who’s passion for house music is evident in the eclectic, slick sets she frequently lays down.